The Doomben 10,000 is now the first Group 1 race of the Brisbane Winter Racing Carnival after the 2017 changes saw it moved forward a fortnight. Taking place on a Saturday in early – mid May at Doomben Racecourse, the Doomben 10,000 is a weight-for-age sprint now contested over 1200m having previously been run over 1350m. Offering $700,000 in prize money the race now serves as a nice lead-up to the Group 1 BTC Cup (1300m) – which from 2017 has been known as the Darley Kingsford Smith Cup. Sea Siren (2012) was the last horse to complete the previous BTC Cup – Doomben 10,000 double when the former was held two weeks before over 1200m. The Doomben 10,000 horses are likely to come off a Sydney Autumn Racing Carnival campaign or have had an earlier Queensland lead-up at Eagle Farm in the Group 2 Victory Stakes (1200m) in Brisbane. Following a Doomben 10,000 run, gallopers are likely to follow the new winter path into the Kingsford Smith Cup over 1300m and then into the Group 1 Stradbroke Handicap (1400m) in June – Queensland’s richest race. The latest edition of the Doomben 10000 ran on Saturday May 11, 2019 . The official Doomben 10,000 Race Results 2019 and finishing order will be provided below after the race takes place on Saturday May 11, 2019 . The 2018 Doomben 10,000 Results saw the Gai Waterhouse & Adrian Bott-trained mare English return to winning form with a win up the inside, while beaten short-priced favourite Redzel had to settle for fourth only a half-length off the winner in a blanket finish. Doomben 10,000 betting markets open pre-field with futures odds offering value for punters and Victory Stakes graduates set to dominate the all-in prices. The Doomben 10,000 odds firm once the final field is released and offers a safer bet for punters. Horses drawn well with a barrier between 1 – 5 usually firm in Doomben 10,000 betting, with the last winner to jump from a double digit gate being Mr Innocent (12 of 15) in 2000. This has been ever more notable since 2017 when the race distance dropped from 1350m to a genuine 1200m sprint. Favourites in the Doomben 10,000 odds have a strong record in the past decade with five saluting for the punters from 2007 – 2018 including most recently Spirit Of Boom ($4.75 equal favourite in 2014). The top Doomben 10,000 2019 betting odds on the weight-for-age sprinters will be provided here once markets are out so stay tuned to check the Brisbane Winter Racing odds on offer for your selections. The Doomben 10,000 field attracts a line-up of the season’s best weight-for-age sprinters and from 2017 after being moved forward two weeks, became a winter carnival kick-off point for sprinters. The largest Doomben 10,000 field in recent years was 20 starters when Red Oog won from the inside barrier in 2005. The only time in over 30 years the Doomben 10,000 field featured under 10 runners was when Beaded defeated just six rivals in a seven-starter field in 2011. Horses come into the Doomben 10,000 field via a number of races, but after the race was moved in 2017 the Group 2 Victory Stakes (1200m) in Brisbane is now the key lead-up event. Doomben 10,000 nominations close on the Tuesday of the week before race day, with the final field of acceptances closing on the Wednesday of race week. 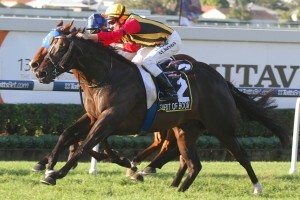 Spirit Of Boom (2014) was the last favourite in Doomben 10,000 betting to salute for the punters. Photo Credit: Daniel Costello. The Doomben 10,000 form guide features all the must know info and stats for punters looking to place a well-informed wager on the race including the jockeys, trainers, barriers and lead-up runs of all the horses in the field. Barrier seven produced five of the 11 Doomben 10,000 winners from 2007 – 2018 – including Music Magnate in 2016 – and is considered the best gate to draw. Sydney visitors have a solid record so watching the Doomben 10,000 form for Sydney-trained horses that ran well in a race like the All Aged Stakes over 1400m at Randwick in the lead-up is important. The Doomben 10,000 form has stacked up in future Group 1 Brisbane races in recent years including the $1.5 million Stradbroke Handicap (1400m / 1350). In 2015 Boban won the Doomben 10,000 before a Stradbroke second, while Generalife ran third in both races that year. A link to our comprehensive Doomben 10,000 2019 Form Guide will be provided for punters below the week of the race. Doomben 10,000 tips over the past decade have favoured winter sprinters coming off a BTC Cup run. From 2017 however the best betting guide to Doomben 10,000 tipping is the Sydney Autumn Carnival sprint races and the Victory Stakes run over the 1200m in Brisbane two weeks prior. Horses with proven weight-for-age form, previous Brisbane runs and that are drawn nicely are also useful Doomben 10,000 tips. The Ladbrokes’ exclusive Doomben 10,000 betting tips 2019 will be detailed below the week of the race so bookmark this page for the horses to back and sack. Favourites have a credible record in the Doomben 10,000 results, but notable recent upsets include Boban ($17 in 2015) and Undue ($44 in 2006). Some of the most famous recent Doomben 10,000 winners include the subsequent inaugural The Everest winner Redzel (2017), Spirit Of Boom (2014), Sea Siren (2012) and dual champion Apache Cat (2008-09).